I saw the trailers for Hidden Figures. I enjoyed them. I figured I’d enjoy the movie, but it just wasn’t a priority for me to see it. And as a certain nameless someone close to me absolutely raved about it, I knew it was only a matter of time before I saw it anyway. Six months later, the movie is out on DVD, and now I’ve seen it. It was good. It was all right. Nothing to complain about. I liked it well enough. I’m not going to bother avoiding spoilers with this one, by the way. The story mostly follows three black women, Katherine Goble, Mary Jackson, and Dorothy Vaughan. The year is 1961, and they work as computers at NASA in the middle of the space race, their services being extremely important to America’s effort in beating Russia. Katherine is especially gifted with numbers and math, and she is assigned to the very heart of things in the Space Task Group, and not only are her contributions vital, she proves herself to be a cut above the rest. Mary is an aspiring engineer, and the first black woman to become such. Dorothy is the unofficial supervisor of the team, and one who eventually gains official recognition as she refuses to let herself and her coworkers become obsolete with the introduction of the IBM, but rather finds a way to make them all vital in running said machine. All three have their own personal struggles, make their own sacrifices, and reap their own rewards, not the least of which are the love of their husbands, the trust of those rely on them, and the recognition of their peers. All this at a time when America was still trying to bridge the racial divides which plagued the nation on many levels. There’s the segregated bathrooms and coffee pots, which Al Harrison, leader of the Space Task Group and NASA overall, abolishes when he becomes aware of how inconvenient they are to Katherine, and thus to NASA, and thus to America. There’s the rigged requirements Mary faces to become an engineer, involving gaining admittance to night classes at an all-white high school and putting a hole in the state’s educational barrier. There’s the prolonged refusal to grant Dorothy official supervisor status, until her coworker and supervisor not only grants it, but also changes how she addresses Dorothy to “Mrs. Vaughan,” her equal. Bit by bit, the divide begins to close. On which note, I love the example set by John Glenn, the first American astronaut to circle the world in orbit. He treats Katherine and the others as simply people, not caring what color they are. He values their contribution, as the math he doesn’t understand is vital to his success and survival. He meets Katherine more than once, coming to trust her and her math completely, even with his life. And when he refers to her, not recalling her name at the moment, he says, “the girl, the smart one.” Not “the black one.” The smart one. Truly, an example to emulate, one which utterly ignores race and skin color. Oh, and the courtship between Katherine and the man who becomes her husband, Jim Johnson, was quite respectable. As was the relationship between Mary and her husband, which, there was a little strife between them, but he loved and supported her completely. Really, there’s a great deal to appreciate about this movie. It’s beautiful, it’s heartfelt, and it’s a pretty realistic depiction of historical events. Even more, it comes to us at a time where racial strife in my country has been reignited in an ugly way, and we can use more stories about healing the rift instead of widening it. 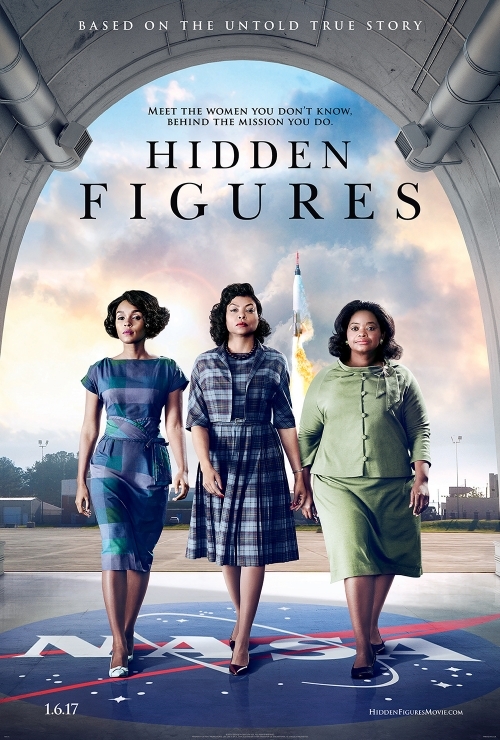 Heck, I never knew that NASA employed black people back then, and to see their contributions made known on the big screen is quite gratifying. All the same, there is something that the movie just kind of… lacks… for me. The certain-nameless-someone who insisted I see it thinks that must be superheroes and violence and such, but that’s not it. What it lacks is: tension. Yes, in action movies, we have physical tension, but that’s not that the only flavor of such. There’s emotional tension, psychological tension, dramatic tension, and so on and so forth. Heck, even Apollo 13 had tension both physical and emotional, and we do know the ending of that story, just as we know John Glenn successfully made it to space and back. So, it wasn’t just that we know what happens. What I guessed from the trailers, and which proved accurate, is that the narrative doesn’t feel compelling to me. There’s nothing really driving me to keep watching or demanding my continued attention. Despite this, I still found myself smiling and laughing with the characters, and feeling for what they endured. Hidden Figures really is a good movie, and welcome in my personal collection. It’s just not an epically great movie, is all. This entry was posted in Movies, Tuesday Review and tagged Hidden Figures. Bookmark the permalink.